One of the things I love to do when I travel is to go to sporting events. MLB, NHL, NBA, NFL… you name ‘em, I’ll go watch. Ben & I even went through a B-sport phase for a while there too. Remember the old RHI? Probably not, but we once paid over $150RTN to take a taxi to the middle of the desert to watch a roller hockey game in Vegas. Luckily, on this adventure we only had to go to Queens. Last year we went to new Yankee stadium. Love or hate the Yankees, seeing a game in their house is a magical thing. The stadium lacks charm, the food is horrible and the beer selection is limited to Bud or Bud Light. But the fans are amazing and hey, it’s the YANKEES! This year, I must admit I checked the Yankees schedule first and when I found they were on a road trip, I then went to the Mets schedule. The Mets were in town, playing Arizona. Not a marquee match-up, but it was more about going to check out new Citi Field than going to watch the actual ball game. We got on the subway and made our way to Flushing. On the train, we noticed the first difference between the Mets and the Yankees. Last year the subway was packed with Yankees fans, this year there were 4 others on our train to the game. When we approached we saw a huge parking lot. 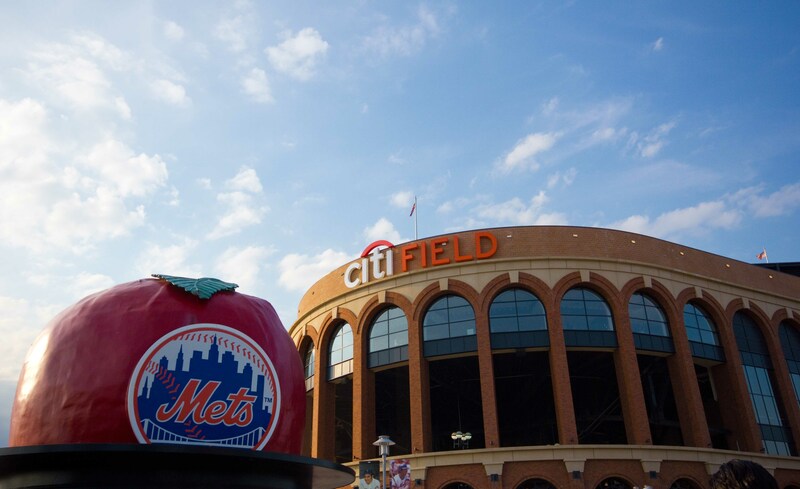 Mets fans drive to the game. When you go through the front gates of the stadium, there’s a tribute to Jackie Robinson. It’s a pretty inspiring entrance to a ballpark. 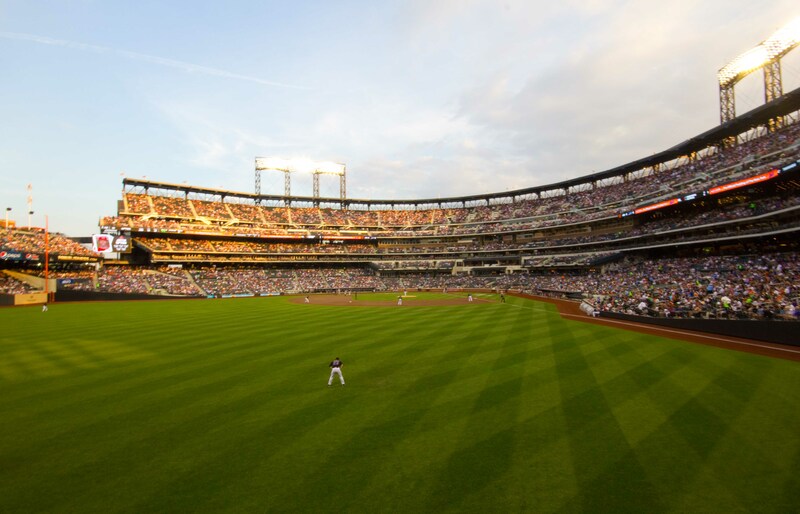 The tickets to a Mets game are pretty expensive and I just couldn’t justify spending $150 per ticket to sit in my “usual” location, (infield-1st baseline). Instead, we chose to sit in the outfield and loved our front row seats, with a clear view of the park. We took a walk around the concourse before the game to assess the food situation and noticed that the choices were good and plentiful. It looks like the people of Citi went out and found the hottest food purveyors in New York. I was tempted by the Blue Smoke ribs and the Catch of the Day Lobster Roll and even contemplated the brick oven pizza. 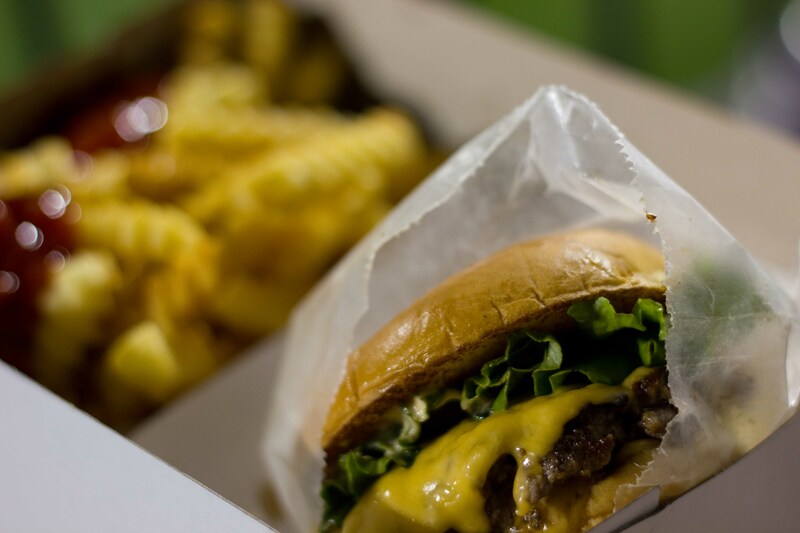 In the end, despite the line-up, the Shake Shack won out. There are several Shake Shacks around Manhattan, but every time I’ve passed them, they always have a line up. 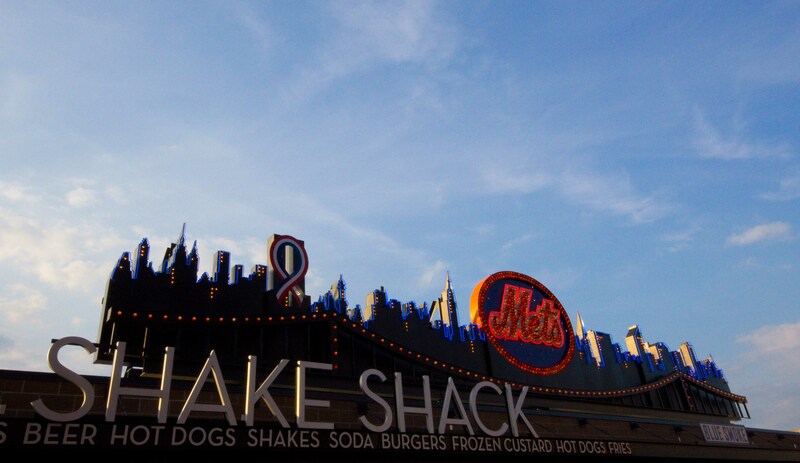 Same for the Shake Shack at Citi, although this one was really long. We weren’t that keen on standing in line for over an hour to get food at a ball game, but when we came back during the 3rd inning, the line-up wasn’t as bad. There were also enough screens in the center concourse where the Shake Shack is located to keep you in the game. While I was taking this photo while standing in line for my burger I noticed that there was a taqueria across the way, so I wandered over. 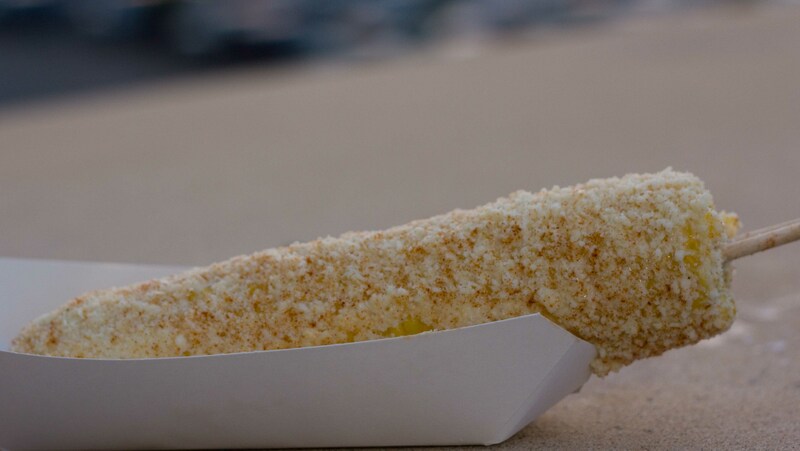 El Verano Taqueria had elote corn, which I had read about and so I bought one to munch on while waiting in line for our burgers. Steamed corn brushed with mayo, sprinkled with coteja cheese. It was so good, I didn’t want to share. I will definitely try to recreate this at home. We missed 2 innings of the ball game standing in line for my Shake Shack burger and fries. Standing in line, I was almost tempted to get a black and white shake because it seemed like every other person was ordering it. But I’m not much of a milk shake person, so for the one and only time on this trip, there was an ingestible that I said no to. Was it worth the wait? The burger was very flavourful and the buttery bun was more than just a vehicle for the meat. The crinkle cut fries were wonderful. Hot, perfectly salted, crispy on the outside and nice and potato-y on the inside. Perfection! The ball game was fun and the food we sampled was amazing. 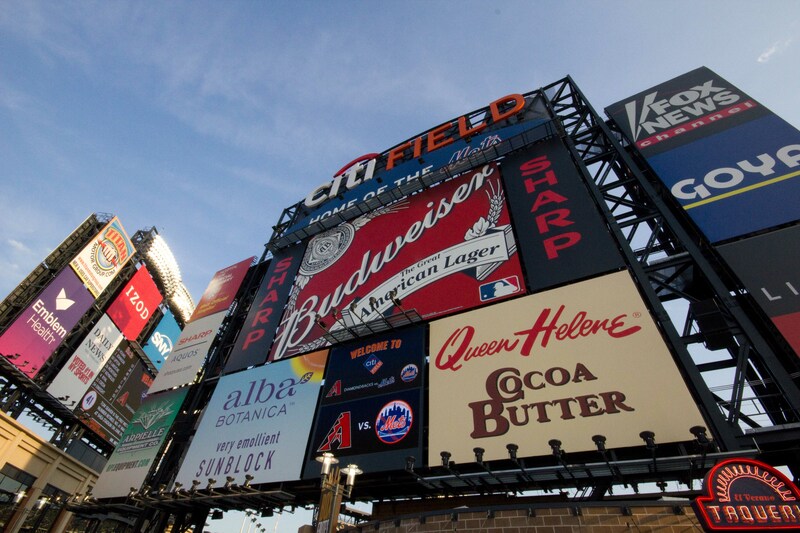 Citi Field is also one of the prettiest ball parks I’ve ever visited. Yeah, I know they’re not the Yankees, but I had a fantastic evening nonetheless. Oh, and the Mets won the game in the bottom of the 9th!